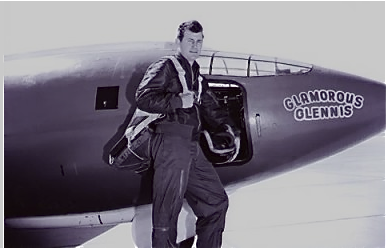 November 14, 1947, Chuck Yeager broke the sound barrier by flying his X-1 jet 670 mph. It was believed that traveling faster than the speed of sound was impossible and any aircraft that tried would break up in flight. Yeager's history is legendary. On the 50th anniversary of his historic flight he went back up and broke the sound barrier again. Now 87, he is retired in California. If you'll recall, I recommend the book or movie of The Right Stuff as November reading or viewing. I reiterate the recommendation. In the meantime, Happy Anniversary, Chuck!